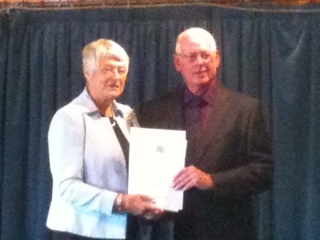 Pictured is Dame Janet Trotter, DBE, Lord Lieutenant of Gloucestershire, presenting the award to Derek Britton of the Longwell Green Community Centre Management Council. The Queen's Award for Voluntary Service, which is made annually, recognises and rewards excellence in voluntary activities carried out by groups in the community. The Queen announced the Award in 2002 to mark the occasion of her Golden Jubilee. The Award is given every year in recognition of outstanding achievement by groups of two or more people in the United Kingdom, Channel Islands and Isle of Man who volunteer their own time to enhance and improve the quality of life and opportunity for individuals or other groups in the community. Longwell Green is a registered charity, no. 301564, and was founded for the benefit of the local inhabitants of Longwell Green. Longwell Green Community Centre is a not for profit organisation. The centre is not supported by grants or funding but is self-supporting via annual membership, renting facilities and fundraising events. Longwell Green Community Centre is held upon trust to further the health and advance education through training, recreation, social, moral and intellectual development to benefit the inhabitants of its community. The Charity is administered on behalf of the members by Trustees who are elected by members. As such the land and property belong to the members and are held (legally) by the Trustees. All activites of the Trustees are governed by the Charities governing documents and constitution. The Trustees are responsible for the management, development and well-being of the centre. They must ensure that it operates within the contraints of the governing document and statutory law.